Dr Bradley Nelson.DC, USA. ' Discover Healing with The Emotion Code & The Body Code' . Dr. Bradley Nelson, DC from the USA, is joining the inaugural World Energy Conference as a renowned Keynote Speaker with his World famous Body Code & the Emotion Code of which he is the Founder. 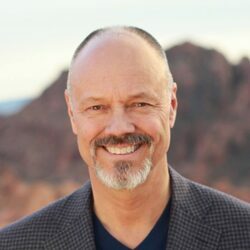 Dr. Bradley Nelson, DC (retired) is a world renowned specialist in the emerging fields of bioenergetic medicine and energy psychology,a renowned holistic physician and a lecturer. He is author of the best selling book 'The Emotion Code' which to date has been translated into many different languages. Dr. Brad. teaches seminars internationally on the methods of healing he has developed. Dr Brad. as he is affectionately known will be presenting ' Healing with The Body Code & The Emotion Code' including live demonstrations throughout. In The Emotion Code, Dr. Brad. skillfully lays bare the inner workings of the subconscious mind. He reveals how emotionally-charged events from your past can still be haunting you in the form of “trapped emotions”; emotional energies that literally inhabit your body. During Dr Brad's presentation, you will discover how releasing emotional baggage helps you to feel renewed and joyful in both body and soul. The Codes allow you to feel empowered and to detect your own unique wellness needs, remove causes of pain and illness, nurture your body, reduce stress and cultivate happiness. You can join Dr Brad on Facebook here. 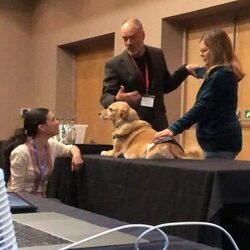 Dr Brad working with a doggy delegate at the Animal Energy World Conference May 2018.